Marketing leaders have a wide array of metrics to gauge marketing effectiveness. But more metrics don’t necessarily mean better insights into marketing performance. Marketing leaders need to let go of ‘feel-good’ metrics, like click-through rates or traffic, and instead embrace metrics that link marketing activity to business outcomes. The concepts behind measurement are simple enough: you measure activities, communicate results, and ultimately satisfy business goals. The reality is a different story. Most marketing leaders struggle to effectively measure and prove the value of marketing’s activities against business outcomes – unable to link their efforts back to revenue, profitability, or customer retention. There are many reasons, but many find themselves ill-prepared, lacking cross-functional buy-in and the internal analytics skills necessary for measuring marketing’s quantitative value and future outlook. To link marketing initiatives to business value, marketers must seek out metrics that are indicators of marketing success and operational excellence – providing insights of future engagement and risk. To learn more about linking marketing efforts to business outcomes, see Gartner’s “How to Prove the Value of Marketing to the Enterprise” (Gartner subscription required). The research describes how teams should be using leading, lagging, and operational indicators to maximize program ROI and future marketing investments. Leading, lagging and operational indicators work in tandem to help you track your progress through to the final results. Think of it like a simple equation where [action] = [results]. Start with the results you want (lagging indicators) and then work backward to identify the necessary actions (leading indicators) to achieve those results. Lead a brainstorming workshop with marketing and sales to capture key leading and lagging indicators. Introduce measures to test the leading hypothesis — select goal that is well understood and mapped to single leading indicator at first. Demonstrate that improvement in a leading indicator will actually shift the needle on business performance. If improvement is not seen, assess why — unachieved leading indicator measure? If leading indicator met, but result not, re-assess action — result correlation assumption and adjust. Become a master of your marketing and sales data by thoroughly reviewing/studying data from your CRM and your martech systems. Assign marketing resource(s) for daily review, enabling marketing to execute quick actions as needed. Balance your performance reporting with leading, lagging and operational indicators to give the executive management team the wisdom for future investment. How are you developing your KPIs? 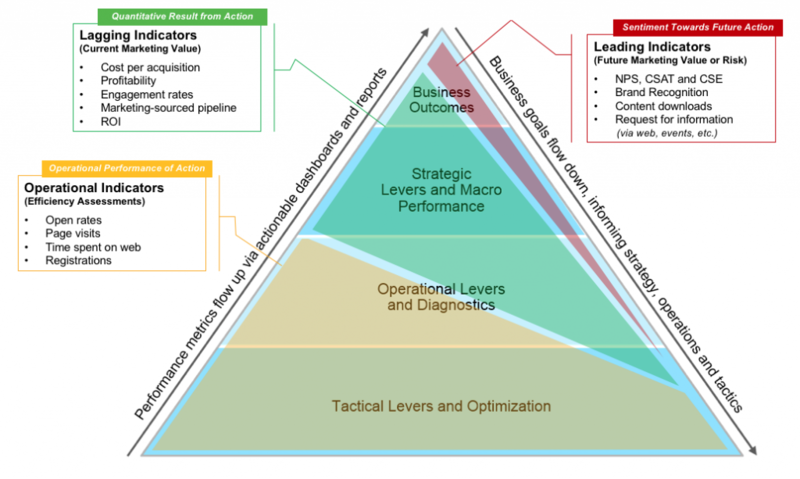 Do you feel you have a balanced view, leveraging both leading and lagging indicators? Let me know your thoughts. Thanks for the information and article is awesome, I personally think that marketing and advertising is key to the success of every business especially startups.